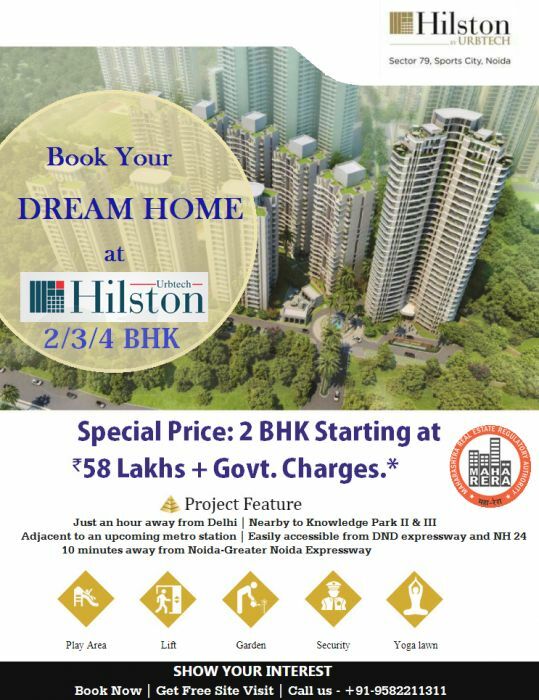 Urbtech Hilston is the new launch beautiful residential project strategically situated at Sports City, Sector 79 Noida. The well-placed location has a solution to investing money in the property. The well designed project suites your personality and enhance the way of living. The property is designed by Urbtech Group according to your budget. Urbtech Hilston Sector 79 Noida offering 2 BHK, 3 BHK and 4 BHK in Several Sizes. You can choose 2 BHK+Study in 1310 sq.ft & 1320 sq.ft. & 1390 sq.ft. , 3 BHK in 1650 sq.ft. & 1770 sq.ft. and 4 BHK in 2520 sq.ft. It is one of the best property for sale in Sports City Sector 79 Noida. Book now and grab the special offer. The project has 8 luxury towers and an Iconic Tower.